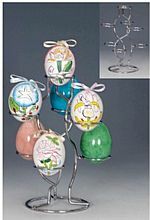 Crystal balls, decorative eggs, witch balls, art glass orbs....if these are some of the collectibles you own, you owe it to yourself to check out our collection of egg stands, decorative egg holders, crystal ball displays and sphere holders. These beautiful pieces deserve to be on display! Pair with a glass dome or curio display case to keep your pieces protected and dust free! Please Select...1 1/2" Squ. x 1/2"H - Opening on top 7/8"Dia. 2"Squ. x 1/2"H - Opening on top 1 1/8"Dia. 3" Squ. x 3/4"H - Opening on top 1 1/2"Dia. 3 1/2"Squ. X 3/4"H - Opening on top 1 7/8"Dia. Check out our Mirrored Placemats and Tablemats too!